A staple of Spanish and Mexican cuisine, seasoned rice with tomatoes gets a facelift by trading the starchy grain for fresh cauliflower. Not only can you instantly boost your vegetable intake in an effortless and delicious way, but you won’t need to wait for those dry grains to slowly steam. Round out any meal in minutes with this quick, versatile side. If you wish to rice your own cauliflower, cut the cauliflower head into florets, toss the pieces into your food processor with the “s” blade attachment, and pulse until broken down to a crumbly, grain-like consistency. Transfer to a clean kitchen towel or paper towel and pressing to remove excess moisture. Add more spice to the dish by using drained pico de gallo or chunky salsa instead of plain diced tomatoes. Per Serving: 70 calories; 5g fat; 6.3g carbohydrates; 2g protein; 0mg cholesterol; 233mg sodium. love spanish rice, love cauliflower rice. this is a really great, easy recipe. i served it with grilled chicken and grilled zucchini. Just when I thought I was over cauliflower rice! This recipe was so yummy! 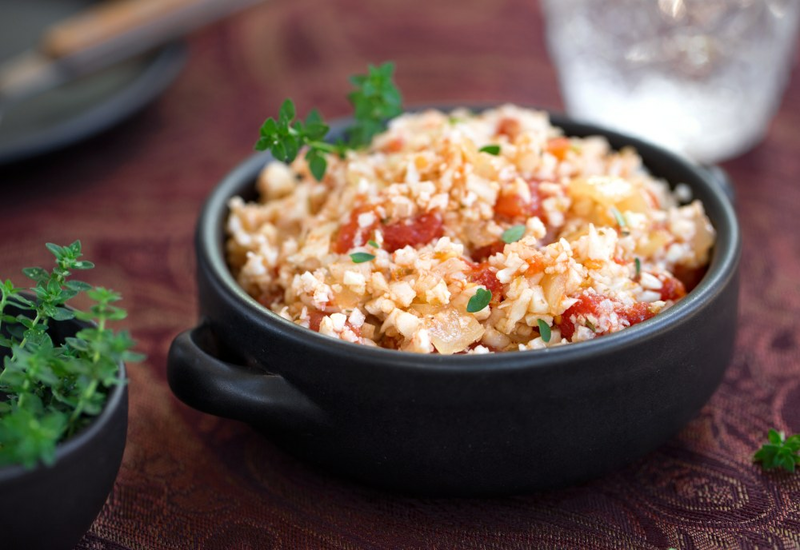 The onion, garlic, and tomato makes this "rice" taste very authentic and flavorful. Next time I have to try it with pico. My wife is all about cauliflower rice, and she loves it when I make this Spanish version. It's so simple, I love that the ingredients are all common pantry items. This is perfect when you want something simple and delicious.